New York City is often thought of as a playground for adult visitors, but don’t underestimate the variety of attractions available to children. There are plenty of kid-friendly spots to visit throughout the city, and no end of delights for children of all ages and a trip to the Big Apple with children can be endlessly entertaining. The American Museum of Natural History is located on the edge of New York’s famous Central Park, an enormous complex of several buildings that host both permanent and temporary exhibitions. With well over 30 million artifacts sourced from our natural world, this museum never ceases to educate both children and adults. Watch as children marvel at huge gemstones, life-sized replicas of whales, patiently built dioramas and the fossils of a terrifying Tyrannosaurus rex. This skyscraper holds a place in the imagination of children across the globe. While its history and design may not be the most valuable aspect of this building for children, they nevertheless gleefully visit the observation deck for incredible views and an opportunity to use some of the vintage coin-operated binoculars to scan the horizon. Children will also enjoy a visit to this landmark at night as they watch the city below twinkle in miniature. Watch as children’s imaginations unfurl when they walk through the doors of this popular toy store. Let them peruse the several floors of this imaginative and colorful wonderland as they tinkle the ivories of the famed jumbo piano keys. Make sure to block out plenty of time to fully enjoy the many departments and floors this store has to offer. FAO Schwarz should not be missed by children nor the young at heart. When you need a break, a café provides relief to the weary parent, while several thousand square feet of candy aisles will satisfy any child’s sweet tooth. Any child will love it here, so a trip to New York is a great idea for a family. 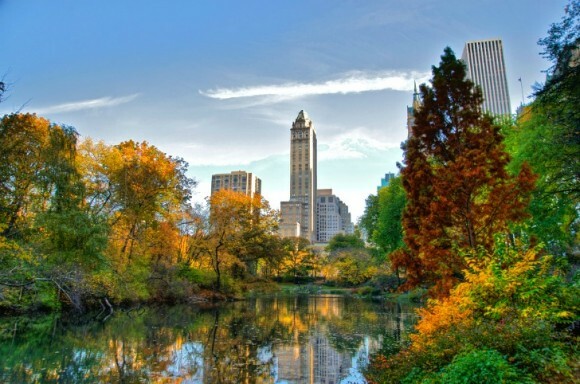 Get on to Cheapflights, pack your bags, and make your way to the Big Apple – you won’t regret it! If you’re willing to take a short trip out of Manhattan, head to the South shore of Brooklyn and visit Coney Island, a mecca of entertainment that will not fail to amuse both children and adults. Take a stroll down the boardwalk and treat kids to a funnel cake while they look ahead to the classic amusement park rides. A turn on the giant Ferris wheel lets New York City show off while offering a few moments of rest tired parents, and when the whole family needs a break from all the excitement, visit Coney Island Beach and relaxed in the sand while the children play along the shore. As dusk falls, stay a while and enjoy a free fireworks show that illuminates the water. This Midtown attraction is many things to many people. While adults may enjoy it for a Broadway show or a New York-style slice of pizza, children will enjoy a visit to this frenetic landmark for its shopping opportunities and magical lights. No trip to Times Square with children is complete without a visit to the enormous Lego store. Let children browse the bins as they design their own Lego sets and enjoy the hands-on displays. After shopping, stand in the middle of the square as the sun sets and the billboards come alive. Yes you gave a very great suggestion. It would be very educational for the kids to visit the American Museum of Natural History and also it would be fun for them. The Empire State Building is also very beautiful I myself would love to look at it. My kids would also love shopping at FAO Scharz or Time Square. I would also be excited to visit amusement parks such as Coney Island. I am a big fan of Ferris wheel. This would be a great opportunity for me to make the best vacation together with my family. Thanks for sharing!